Scientists solved the problem of the Ghost Particle in less time than it’s taken the Alberta government to come up with a creative approach to economic diversification. For 40 years Tory premiers talked a good line about diversification but with the exception of Premier Lougheed, they failed to deliver. Now, after five short months in office, the NDP government is tackling diversification head on. Budget 2015 allocates $2.1 billion to support job creation and diversification by encouraging government-owned entities (ATB Financial, the Alberta Enterprise Corporation and the AIMCo) to help companies get the financial capital they need. Opposition critics and academics panned the idea saying the government can’t tell its arms-length financial institutions what to do. Former Tory finance minister, Ted Morton suggested that the boards of these institutions would resign en masse. This fear mongering is about as frightening as the werewolf who rang your doorbell last night threatening to trick you if you didn’t give him a treat. Budget 2015 includes another mechanism to support diversification–$17.6 billion allocated to the department of Advanced Education over the next three years. This includes a two year tuition freeze and increased support for scholarships, grants and student loans. However, before the government can use any of this amount to support diversification it will have to come to grips with the Tory government’s Campus Alberta strategy. Campus Alberta was touted as a way to enhance communication across Alberta’s universities, colleges and technical schools. In reality it was nothing more than an effort to reduce costs and increase the industry focus of Alberta’s educational institutions in order to address industry’s complaint that universities and trade schools weren’t churning out enough tradesmen and engineers to meet industry’s needs. The inanity of that complaint in a province roiled by a boom/bust economy is obvious. If Alberta is to succeed in diversifying its economy it must take a long view and invest in pure research that will create opportunities we can’t even imagine today. This is where the Ghost Particle or neutrino comes in. In the 1960s Ray Davis, a physicist, and John Bahcall, a theorist, began to investigate neutrinos, the particles inside the sun that give it energy and make it shine. 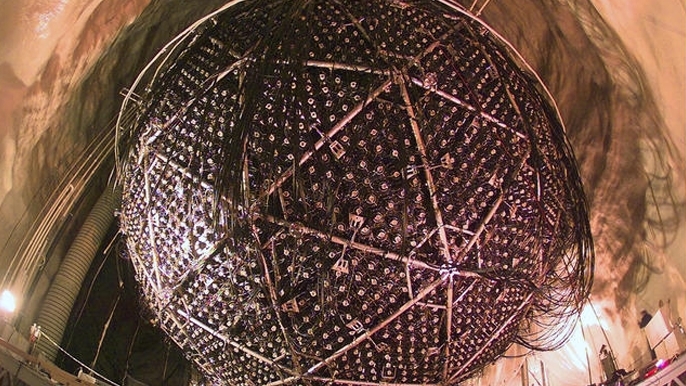 Bahcall created a mathematical model to determine how many neutrinos the sun created. Davis designed a neutrino trap, essentially 600 tons of cleaning fluid, in a lab buried deep in a goldmine in South Dakota. Capturing a neutrino was quite a feat notwithstanding the zillions of neutrinos flying through the atmosphere—there are 100 trillion neutrinos streaming through your body this very second. In any event, something went wrong. Davis was able to capture only one-third of the neutrinos that Bahcall’s predicted were coming from the sun. The scientific community was convinced either Davis or Bahcall had gotten it horribly wrong. Undeterred, the scientists spent 30 years perfecting their models and experiments but the results never changed. Then in the 1970s scientists discovered that neutrinos come in three “flavours” (don’t you just love physics talk)—electron, muon and tau. Davis’s neutrino trap was designed to capture only one flavour, the electron neutrino. They needed a new experiment. Enter the Canadians who together with university teams from the US and the UK built the $73 million Sudbury Neutrino Observatory (SNO). It was constructed piece by piece, like a ship in a bottle, deep underground in an unused part of an INCO mine. It’s huge. The neutrino detector is tucked away in a rock cavity 10 stories high. In 2001 Dr Art McDonald proved Davis and Bahcall were both right. The sun emits electron neutrinos, but they constantly change flavour as they travel through space. By capturing all three flavours Dr McDonald was able to explain why Davis saw only one-third of the neutrinos called for by Bahcall’s model. He also learned some amazing things about particles that can pass through the centre of the earth and create the energy that fuels the sun. Fourteen years later, smack in the middle of the federal election, Dr McDonald was awarded the Nobel Prize in physics. Three lessons can be taken from the SNO project. Basic research is driven by academics and the scientific community, not industry. It takes time and requires government funding. The academics and scientists pursued the neutrino for over four decades. INCO enthusiastically supported the SNO project by providing the mine shaft and carrying out the preparatory work at cost, but it didn’t fund the research, “partner” with the scientists or influence the purpose of the research. Funding came from the federal and provincial governments. The Notley government’s plan to diversify the economy is an attempt to look into the future and think ahead about the society Alberta is going to have. It requires ongoing stable funding for advanced education so that Alberta’s universities and colleges aren’t forced into “partnerships” with industry in order to satisfy industry’s need for skill sets that are useful today but obsolete tomorrow. This entry was posted in Education, Politics and Government and tagged Art McDonald, Campus Alberta, Economic diversification, Floyd Laughren, Neutrino, Peter Lougheed, Rachel Notley, Sudbury Neutrino Observatory, Ted Morton. Bookmark the permalink. Brilliant philosophic case for stable funding of post-secondary education Susan,without which our species might well become extinct–deservedly so. Thanks Judy. As you correctly point out, humanity is facing complex problems, surely it’s more important now than ever for governments to support post secondary education and, in particular, basic research. I didn’t realize this but when the SNO scientist asked the Ontario government to kick in $7.6 million to support the project it was the first time ever that a province had been asked to support a basic science driven initiative. That was in the mid 1980s–not so long ago. The particles of reality exist within our brains, our minds, vibrating at various frequencies, not unlike neutrinos. Thus it is important that pure science be financed by society in order to help us understand the mechanics and meaning of existence. Agreed anonymous. I found the Steve Reich piece mesmerizing. By the end I thought I heard a 1-2-3 thing going on which made me think of electrons, muon and tau and then I thought my little brain was overthinking things. Thanks for the intriguing link. At the end of the day, Susan, our little brains is all we have. Indeed. And what’s amazing (and reassuring) is how similar our brains are regardless of who where are and where we come from, I’m thinking of the similarities between the Balinese Steve Reich percussion clips. My feeling is that our latest advancements in science -relativity theory, quantum mechanics, expansion of the universe and dark energy, particle physics, entanglement, black holes and the big bang – are bringing us ever closer to a smooth, impenetrable wall of infinite height and extent that functions just like the singularities that we are finding at the end of every avenue of fundamental science that we pursue. ABCanuck I was with with you until we got to the smooth, impenetrable wall… A while ago I watched a series on PBS about string theory. It was fascinating (and incomprehensible) and made me wonder how theoretical physicists maintain their sanity. On the topic of neutrinos, seems to me the more we learn about what gives the Sun its energy, the better off we on Planet Earth will be. GoinFawr…yes, the Tories could learn a thing or two from Mr Rzykrusk and the Tau. Why is it that some of the best quotes come from these unlikely sources? Is it because the story lines are timeless and universal? Maybe Susan, though I confess that, unless one writes the code themselves, I’m not sure how much there is to actually learn about real physics from Shas’el’s ‘Tau’ (A commander in Warhammer 40k, a sci-fi board/video/card game), but I will say that I’ve always found Tim Burton’s take on the ‘duality of mankind’ entertaining, even edifying. Perhaps the best quotes so often come from ‘unlikely sources’ because out there on the fringe they endure less scrutiny from those who’s feet they hold to the fire; they are misjudged as too small a fish to fry, devoid of influence, and their ideas are released to the public before they can be sanitized in order to reinforce, rather than draw into question, the messages of the status quo. GoinFawr, no doubt you’re correct…fictional characters can say whatever they like and get away with it. Real people on the other hand need to watch themselves because even they’re nobodies when they start spouting off, if they step in public life someone somewhere will scour everything they’ve ever said in social media and, if it’s juicy, they’ll hang for it. It’s the Brave New World. what does a ‘knowledge economy’ look like and how do expand our ability to move beyond the urgent needs to the critical needs of clean energy, water, food, cooperation and community?? David, Victoria BC is a good example of a city that embraced the knowledge economy. It has a thriving tech sector–900 tech companies that employ 15,000 people. It generates $3.2 billion in annual revenues. Very impressive for the town that used to be known as home to the “newly wed and nearly dead”. There’s so much Alberta could do with the talent it has–medical innovation springs to mind–but that means we have to find a way to crawl out from under the energy giants who dictate to our universities what they should be teaching, and (until now) to our government what it should be funding. I have high hopes for Notley’s diversification plan, I just worry that she won’t have enough time to put it into effect before the next election. But like you say, we absolutely have to focus on the bigger picture–clean energy, water, food, etc. Fundamental Research is the roots to a future blooming society. To understand this, one has to believe in basic concepts, for example, Science. We have just lost 10 years of nothing being done except trade. For the Conservative government life is nothing but markets, business, money and deregulation. The anti-democratic values needed to sustain this kind of society are welcome and forced on us through the control of the media and everything else necessary to keep us in line. One of the great voices in North America against this kind of neoliberal / neoconservative view of life passed away on October 21. Sheldon Wolin was a remarkable mind and ignored by most of today’s shallow politicians for obvious reasons. Here is a good article about him. Without Fundamental Research and independent Universities we will nave no future to speak about. Is it going to change? Hard to say these days. Promises and arguments about niqabs seem to have taken over our lives. Carlos, thanks for bringing us back to Sheldon Wolin. He had an exceptional way of blowing the whistle on what it costs society to accede to the dictates of big business. The recent revelations about U of C President, Elizabeth Cannon, and her relationship with Enbridge is a case in point. Ms Cannon makes $732,000 annually as the university president, she earned an additional $130,500 in her role as director of an Enbridge subsidiary and holds Enbridge shares valued at $810,000 and yet she fails to see that she may have been in a conflict of interest position when she compromised academic freedom by pushing her staff to accept Enbridge’s terms under its sponsorship agreement with the university. The transaction was bad enough, her refusal to accept she may have stepped over the line is even worse. Thank you for letting me know about this case with Elizabeth Cannon. I did not know about it. It is astounding, scandalous and they react as if we are all determined to get them. It is truly disgusting. Carlos, I think the Elizabeth Cannon story is going to get even bigger. The NDP government says they’re keeping an eye on this but I think they should do more to get to the bottom of this and to pass legislation if necessary to prevent universities from becoming too cosy with industry. The university is partially funded with tax dollars so the government has every right to get more deeply involved (in my humble opinion). Susan, I certainly hope that the Cannon story does get bigger, The idea that Universities can only be influenced by industry is ludicrous to start with. Right from the start, when suddenly big corporations dropped big sacks of money in many Universities including the University of Alberta, it was obvious that the end would not be a very happy story. In some situations I agree with it but it should be very clear that the have to keep their hands off. If they are not willing to do that then do not donate. This idea of running Universities like businesses is another one of these Friedman’s dreams that has damaged many Universities and the fun to learn and do fundamental research. Everything now has to have an economic objective or is not worth it. I can understand that maybe we no longer can afford to have Universities fully publicly funded but if that is the case then why not sit down and discuss it rather than just sell our souls to the big bidders. I think that your opinion is correct, I also believe that. Ok…I wanna know…Just how in hell did you know about this comment?